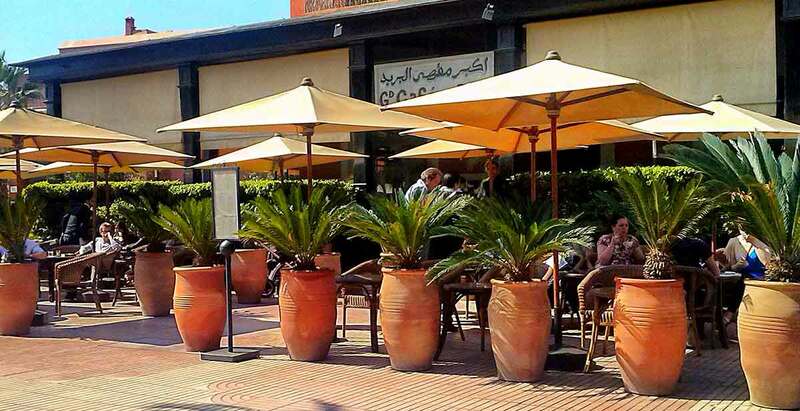 Grand Café de la Poste is located in the center of Gueliz area: against Maroc Telecom, some metters from Mac Donalds and Zara, real hepicenter of Gueliz. The Grand Cafe de la Poste was built in 1925 and is named after the fact was a Coffee bar of the post office. Subsequently, the Pacha Glaoui restored and turned into Cafe restaurant and called Cafe Pacha. After years of neglect, it was reinvented in 2006 and returned to have their moments of glory … a meeting of Marrakchis. The truth is that prices do not invite the local people, to make this site as a meeting place … but worth the visit. Riad Aguaviva recommend you, at least, one coffee at the terrace. Prices run high for dinner, and service can be agonisingly slow – but during the 6pm to 8pm happy hour, a parade of appetisers are offered with drinks, and the wine list is the best in town, also expensive, of course. Moroccan and French cuisine in a very good ambient. It has two floors, a large fireplace and a large outdoor terrace. This landmark bistro delivers swanky comfort and a seared beef tartare . Ate here with colleagues on a business trip to Lausanne. We’d forgotten to let the hosts know about me being vegetarian which always makes me a little nervous when eating as part of a group, but it was fine as La Poste had a mushroom dish as one of their specials. It was very tasty too. Service was ok, although I got the impression that they rather groups order the same food rather than all choosing individually. My wife introduced me to this restaurant and every time i visit Switzerland I make sure to visit this restaurant for the best Filets de Perche. In fact their basic green salad is really delicious as the dressing they use is truly refreshing. Angle Boulevard El Mansour Edhabbi and Imam Malik Avenue.